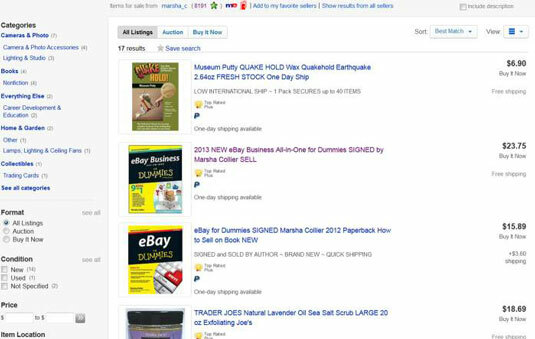 In eBay’s Advanced Search, locate the By Seller link in the links on the left; the By Seller pages show you a list of all the items a seller is selling, and it’s a great way for you to keep tabs on people you have successfully done business with in the past. The By Seller search is also a strategy that eBay users use to assess the reputation of a seller. In the By Seller search field, type the eBay User ID of the person you want to learn more about. If you want to see items that this seller has conducted in the past, select the Show Completed Listings box. You can choose to see all fixed-price listings, as well as auctions, that have ended in the last day, last 7 days, or last 15 days. eBay keeps past item results active for only 30 days; if you’re looking for something sold 31 days ago (or longer), sorry — no dice. In the Sort By drop-down box, select how you want the results of your search to appear onscreen. If you want to see the items that are closing right away, select End Date: Recent First. Choose the number of results you want to see per page. If the person you’re looking up has 200 listings running, for example, you can limit the number of results to a manageable 50 listings on four separate pages. Click the Search button at the bottom of the form. If you’re looking for a specific item from a group of sellers, you can enter the search information in the bottom half of the Advanced Search Find Items page. You may need to perform this type of search after you settle into shopping on eBay and have several sellers you like doing business with (or alternatively, you can exclude sellers you prefer not to do business with). With this method, you can limit the search for a particular item to just the sellers you want, rather than tens of thousands of sellers. When you find a seller who you want to continue doing business with, you can add his or her link to your My eBay: Sellers You Follow area. Just click the Follow This Seller link on the item page. It then appears on your My eBay page, in the Sellers You Follow area. You can search their sales with a click of your mouse!